One of the Master's disciples who receives a copy of the Book of Prophecies. He is a coolheaded Keyblade Master and leader of the Union Leopardus. He prefers to keep his distance from the others and doesn't regard them as comrades. His role is to solve the mysteries of the Book of Prophecies. 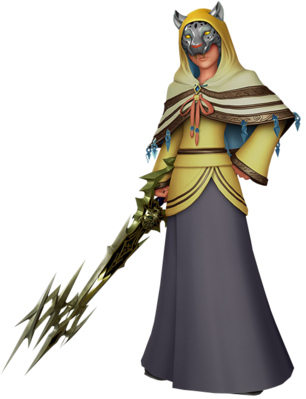 Gula is a Keyblade Master who appears in Kingdom Hearts χ. As a Foreteller, he leads the Leopardus Union and is an apprentice of the Master of Masters. Gula is given a Keyblade forged from his own heart by the Master of Masters, who takes Gula, Aced, Ava, Invi, Ira, and Luxu as his apprentices. Gula eventually achieves the rank of Keyblade Master alongside each of his fellow apprentices. Shortly thereafter, the Master gives a copy of the Book of Prophecies to Gula and grants him leadership over the Leopardus Union as its Foreteller. As Gula and the other Foretellers read their copies of the Book of Prophecies, they are shocked by the final entry, which details an event known as the Keyblade War, during which light would expire and the world would reach its end. Sometime after Luxu mysteriously disappeared to fulfill his role assigned to him by the Master, the Master meets with Gula alone in the Foretellers' Chamber. The Master gives Gula the Lost Page from his copy of the Book of Prophecies and informs him that the Lost Page mentions a traitor among them, and it is Gula's role to discern who the traitor is and stop them. From this, Gula deduces that the Master had given each of his apprentices different roles because whoever diverts from their role could be identified as the traitor. Although disappointed with the lack of impact such a revelation has on Gula, the Master confirms Gula's logic nonetheless and directs him to trust no one but himself. Gula and his fellow Foretellers are soon introduced to the Master's new creation, the Chirithy. Though the Spirit Chirithy are meant to aid Keyblade wielders in their endeavors, the Master warns them that if a wielder falls to darkness, so will their Chirithy, causing them to transform into a Nightmare. When Aced suggests that they destroy any Nightmare Chirithy they come across, Gula and Ava tease Aced for his frightening demeanor, much to Aced's embarrassment. This information is based on alternate scenes or materials and is only considered in continuity if Player joins the Leopardus Union. Over time, the Foretellers notice Keyblade wielders utilizing bangles that provides them the power to collect dark energy, though they decide that using the bangles was acceptable for their Union members. Subsequently, Ira summons the Foretellers for a meeting in the Foretellers' Chamber, declaring that there is a traitor among them after discovering a Nightmare Chirithy snooping around their home. Gula proposes to have each of the Foretellers summon their Spirits to prove their innocence, but Invi points out that it would be easy for any of them to summon a Chirithy that is not a Nightmare. Unable to find a viable solution to discern the traitor, Aced condemns Ira for spreading doubt amongst them and adjures the meeting, prompting Gula to depart from the Foretellers' Chamber. A few days later, Aced invites Ava and Gula to meet with him in a warehouse, where he voices his frustration against Ira's suspicions, and Gula agrees that Ira's claims had no merit since there is no evidence to support them. At Gula's behest, Aced reveals that he wants the three of them to form an alliance, despite the fact that alliances are forbidden. Gula inquires if Aced intends on joining forces to confront Ira, and Aced claims that he wishes to focus on fighting the approaching darkness while Ira is busy identifying the traitor. While Ava declines, Gula accepts Aced's offer for an alliance, but specifies that it is only between them, as he does not want to involve the members of the Leopardus Union. Gula then asks if Ira and Invi are aware of his plan, and Aced admits that he did not confide in Ira, but that he had asked Invi to join them. When Invi arrives, Gula watches as Aced and Invi argue and accuse the other being tainted by darkness. Afterwards, Gula parts ways with his fellow Foretellers. A few months later, Invi persuades Gula to suspend his partnership with Aced. During one of their meetings, Gula explains to Aced that their alliance is meaningless since the alleged impending darkness has yet to come and Aced has not rallied anyone else to his cause. As Aced starts to object, Gula accidentally slips that Invi agrees with the dissolution of their alliance. Aced realizes that Invi convinced Gula to terminate their alliance, though Gula defends that it is his choice to follow through with it. Outraged, Aced reminds Gula that the traitor has not been discovered yet, though Gula cites this to be the motivation for his actions as he is unable to trust anyone else. Aced counters that Gula will not win against the darkness on his own, but an apologetic Gula remains firm in his decision and leaves. A year later, Gula secretly observes Aced and Invi's debacle, smiling as Invi gains the advantage. When Ava is lead by her Chirithy to the scene, Gula calls Ava and they join Invi, who has deemed Aced the traitor. Though Ava is hesitant, Gula summons his Keyblade and encourages Ava to do the same. Aced then launches himself into a vicious battle with his former comrades, from which he barely emerges alive. In the aftermath, Gula looks over the Lost Page in an alleyway and recalls of the role he was given by the Master, reminding himself to trust no one but himself. Gula locates Aced, finding him collapsed in one of the houses of Daybreak Town, and tells him about the incomplete nature of their copies of the Book of Prophecies and the contents of the Lost Page. Summoning his Keyblade, Gula reveals that the Master tasked him to find and stop the traitor, much to Aced's disbelief and rage. Unable to forgive Gula for silently standing by while the Foretellers fought each other, Aced cuts him down with his Keyblade. Before he can finish Gula off, Ava arrives and begs Aced to stop, who consents and leaves Ava to tend to Gula on her own. Knowing that Ira is searching for him, Ava takes Gula into hiding, though Invi quickly discovers them and reports their location to Ira, leading him to confront Ava a few days later. Frightened by the possible consequences, Ava protects Gula from Ira, who calmly retreats after Ava asserts her resolve. When she returns to Gula's side, Gula informs her about the ambiguous contents of the Lost Page, which predicts an inevitable betrayal and "the one who bears the sigil", whom he assumed was Aced. Gula commends the distraught Ava for her scrupulous behavior, blaming himself for basing his actions on the Lost Page. Determined to find out what the Lost Page truly means, Gula intends to summon Kingdom Hearts to force the Master's return and pleads with Ava to help him with his plan. Although Ava declines, as summoning Kingdom Hearts is forbidden, Gula respects her decision and goes off on his own. Sometime later, Gula is approached by Player, Chirithy, and Skuld to ask him about Ava, who has recently vanished. Gula deduces that they are members of Ava's Dandelions, and that they are trying to find Ava to avert the upcoming Keyblade War. Gula tells them that only the Master can stop it, who has disappeared, and the missing Luxu might be the one only to know of his whereabouts. When Gula remarks on the similarities to between Skuld and Ava, Skuld realizes that Ava is searching for Luxu to find the Master. Gula then recites a passage of the Lost Page to Player and co., explaining that the traitor described on it would be the one to bring an end to the world. Gula admits that, although they suspected someone, they were unable to stop them. Chirithy questions if Gula should be divulging the Lost Page to them, and while Gula affirms that he should not, he sees it meaningless to hide its contents now that the Keyblade War is near. Hearing the bells of the Clock Tower toll, Gula announces that the war has begun and advises Player and co. to leave, as each Union will rally their forces to prepare for the war. This information is based on alternate scenes or materials and is only considered in continuity if Player joins any Union that is not Leopardus. During the final confrontation in the Badlands, Player encounters Gula after having fought either Aced or Invi, with Gula remembering them from their previous encounter. Gula shows concern for Player's weakened condition, but once Player confirms that they are fine, Gula engages them in battle. Afterwards, Gula praises their strength and states that the two of them may meet again in the future before he withdraws from the battlefield. Gula meets with the other Foretellers, excluding Ava, and Luxu in the Keyblade Graveyard. Gula is a boy who hides his face under a white leopard mask. His pale yellow, hooded cloak covers a robe, shirt, and sash that are all yellowish-tan in coloration and have dark grey embroidering. Light blue tassels appear on the front of Gula's cloak. Gula's name is derived from the word gula, which means "gluttony" in Latin and is the only Foreteller not by represented by their animal in the Ancrene Wisse, being represented by a leopard instead of a pig. Despite his young age, Gula is a cool-headed and serious individual, though he also shows a more playful side when he teases Aced for his scary demeanor when the latter suggested that the Foretellers should eliminate Nightmare Chirithy they come across. Unlike most of the Foretellers, Gula displays a pragmatic attitude in regards to the Master's teachings, as he willing to accept alliances out of convenience, despite it being forbidden, but would also leave these alliances out of convenience as well. He is highly scrupulous and finds himself in much need of guidance, particularly in interpreting the contents of the Lost Page. In a most extreme show of this behavior, he states his intention to summon Kingdom Hearts to prompt the Master's return. He can be quite rash as well, when he confronts and attacks Aced and assumes he is the traitor. As he is bearer of the Lost Page, Gula becomes distrustful of others around him and believes that he can only trust himself once he was given his role, as instructed by the Master of Masters. The distrust he builds between himself and others finally withers away as the Keyblade War looms upon the residents of Daybreak Town, when he shares an excerpt from the Lost Page with Player and their friends, but only because he believes that it would make no difference if others knew of its contents. Foreteller Gula's Keyblade has a dark blue handle. Its pommel and guard resemble golden lightning bolts, and at the base of its blade is a depiction of a green-eyed leopard. This Keyblade's shaft is comprised of a golden, spiked sword and black fuller. It bears a symbol resembling Terra's mark, and its teeth are formed from a web of crystalline spikes. This weapon's Keychain is made of small electrum crystals, and its token is a talisman that has a Gazing Eye on it. Gula's fighting style revolves around the usage of his natural speed, allowing him deal few but precise hits and the flee to avoid any major counterattack.